The Murtala Mohammed administration set about to revitalise government, the economy and the moral fabric of the society. In the political sphere, government was re-structured to induce greater efficiency and central control by enhancing the roles of the Chief of Staff, Supreme Headquarters, and the Cabinet Office, and limiting the influence of the State Governors. These became members of a National Council of State and not of the Supreme Military Council (SMC), the highest policy-making body. Panels were appointed to consider the creation of more states and the establishment of a new Federal Capital. In the end, seven more States were created in February 1976, bringing the total number of States to nineteen, and Abuja was selected as the new Federal Capital to which movement would begin in 1986., A programme to return the nation to civilian rule was promulgated and vigorously implemented. A 49 member Constitution Drafting Committee (CDC). appointed in October 1975, produced a draft which was later debated and amended by a partially-elected Constituent Assembly. The hallmark of the Mohammed administration was typified by its dynamic foreign policy, prompt recognition of the MPLA regime in Angola. Although too brief for meaningful assessment, the administration was undoubtedly popular and purposeful. It made considerable achievements before Mohammed was assassinated in an abortive military coup on February 13, 1976. Mohammed’s successor, Lt. General 0. Obasanjo, more or less continued Mohammed’s dynamic programmes. These included the war against corruption which Obasanjo strongly denounced in his famous “Jaji Address” of September 1977. For fighting this war, a Corrupt Practices Bureau, an Assets Panel, and a Public Complaints Commission were established. Gambling by casino and pools-betting were banned. The difference between public servants and public officers was entrenched in the constitution of 1979. As it transpired, however, these laudable measures could not uproot the cancer of corruption. In pursuit of the return to civilian rule, Local Government Reform, described as “one of the most important legacies” of the First Military Era was instituted in August 1976. It made Local Governments the “third tier” of government (after the Federal and State Governments) and brought government nearer to the people. Local Government elections held the following December partly prepared the Nigerian people for political participation after ten years of military dictatorship. Further measures to promote the return of civilian rule included the appointment of an Electoral Commission in October 1976 to conduct the state and federal elections, the Constituent Assembly which met from October 1977 to August 1979, and the promulgation of a new constitution, based on the American presidential system, into law in September 1978. The Constitution came into effect on October 1, 1979. Several sensitive issues debated by the Constituent Assembly included demand for the entrenchment of a Federal Sharia Court of Appeal in the Constitution and a Revenue Allocation Formula. Following nation-wide elections in 1979, on multi-party basis, the new state and national legislatures met in October 1979, and returned Nigeria to civilian rule under President Shehu Shagari. The hand-over to civilian rule was one of the political successes of the Mohammed – Obasanjo Administration. The Administration’s economic basis rested on the Third National Development Plan (1975 – 1980) earlier launched by General Gowon in March 1975, and subsequently modified by the MurtalaObasanjo Administration. The Plan sought to achieve annual real growth rate of 9.6 per cent, and provided for expansion of agriculture, heavy and petrochemical industries, infrastructure, housing and education. Agricultural policies and programmes to boost declining food production included the Accelerated Food Production Programme begun in 1974; various World Bank-assisted Agricultural Development Projects (ADP) begun in the mid 1970s; River Basin Development Authority Schemes and the Operation Feed the Nation (OFN) begun by General Obasanjo in 1976. Others were an Agricultural Credit Guarantee Scheme particularly to smallscale farmers, the promulgation of a Land Use Decree in 1978 which nationalised all land, and the establishment of new Commodity Boards. Poor execution of these programmes, a relatively high population growth rate (3 per cent per annum compared with 2 per cent for food), and the premium placed on petroleum exports seriously detracted from the agricultural effort and output. Not only did traditional agricultural exports like palm produce, cotton, groundnut and cocoa decline, but also Nigeria’s food imports steadily rose; including imports of palm produce, which Nigeria had been a major world producer and exporter until the late 1960s. Major industrial and infrastructure developments included steel development, notably at Aladja, Oshogbo and Ajaokuta; new oil refineries built at Warri and Kaduna in 1978 and 1980, respectively, and new port and airport complexes, notably the Murtala Mohammed International Airport in Ikeja, which was opened in April, 1979. Although increasingly contributing to the GDP, industrialisation generally focused on import-substitution and assembly, using mostly foreign technical and managerial expertise despite Government’s Indigenisation Policy. Following the assassination of Nigerian military Head of State, General Murtala Mohammed in 1976, his successor General Olusegun Obasanjo initiated the transition process to terminate military rule in 1979. A new constitution was drafted, which saw the Westminster system of government (previously used in the First Republic) jettisoned for an American-style Presidential system. The 1979 constitution mandated that political parties and cabinet positions reflect the “federal character” of the nation — Political parties were required to be registered in at least two-thirds of the states, and each state was required to produce at least one cabinet member. A constituent assembly was elected in 1977 to draft a new constitution, which was published on September 21, 1978, when the ban on political activity was lifted. In 1979, five political parties competed in a series of elections in which Alhaji Shehu Shagari of the National Party of Nigeria (NPN) was elected president. Obasanjo peacefully transferred power to Shagari, becoming the first head of state in Nigerian history to willingly step down. All five parties won representation in the National Assembly. In August 1983 Shagari and the NPN were returned to power in a landslide victory, with a majority of seats in the National Assembly and control of 12 state governments. But the elections were marred by violence and allegations of widespread vote rigging and electoral malfeasance led to legal battles over the results. In the widely monitored 1979 election, Alhaji Shehu Shagari was elected on the NPN platform. On October 1, 1979, Shehu Shagari was sworn in as the first President and Commander-in-Chief of the Federal Republic of Nigeria. On December 31, 1983, the military overthrew the Second Republic. Major General Muhammadu Buhari, became the military leader of the new government, citing charges of corruption and administrative incompetence as reasons for military intervention. Buhari emerged as the leader of the Supreme Military Council (SMC), the country’s new ruling body. 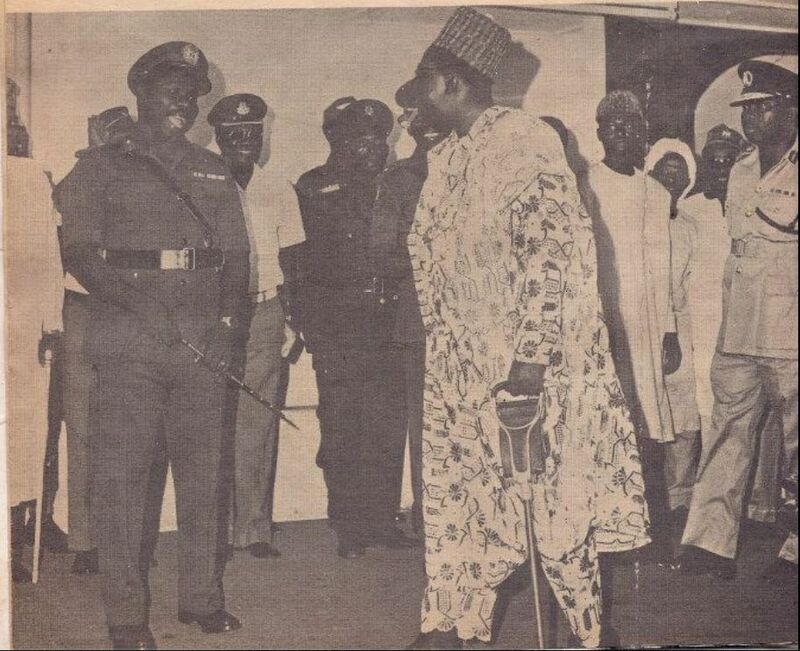 President Shagari was placed under house arrest, and several of his cabinet members were either jailed or exiled. The Buhari government was peacefully overthrown by the SMC’s third-ranking member General Ibrahim Babangida in August 1985. Babangida gave misuse of power, violations of human rights by key officers of the SMC, and the government’s failure to deal with the country’s deepening economic crisis as justifications for the takeover. During his first days in office, President Babangida moved to restore freedom of the press and to release political detainees being held without charge. As part of a 15-month economic emergency plan he announced pay cuts for the military, police, civil servants and the private sector. President Babangida demonstrated his intent to encourage public participation in decision-making by opening a national debate on proposed economic reform and recovery measures. The public response convinced Babangida of intense opposition to an economic recovery package dependent on an International Monetary Fund (IMF) loan.